Amanda is the most well behaved and mature of all of us siblings. She has fawn colored fur and her ears are a bit large. She is very innovative and is always full of creative energy and ideas. She is always making sure that we behave... or at least she thinks she keeps us from misbehaving! Click here to see all of the designs with Amanda! Monica is gray with a teeny, tiny body and big feet! She tends to be sweet, innocent and charming. Don't let her know but even though she is my little sister, I find her to be very precious! Click here to see all of the designs with Monica! Mudpie is my brother. He has brown fur and a little nick in his ear... I tell him that his name really should have been "Nick." Amanda blames me for the nick in his ear. I however, blame the piece of cheese that we were both racing to eat. It's not my fault that his ear resembles swiss cheese! Mudpie is really lazy. His two favorite activities are eating and sleeping. He's a true Mouse-potato. Click here to see all of the designs with Mudpie! Muzzy is fuzzy! He has really long hair which is dark grey. He is very, very curious and extremely investigative. Click here to see all of the designs with Muzzy! I am reddish-brown and have a perpetually curled tail. I kind of think that I am extremely goodlooking, in a handsome mouse like way. My family thinks that I am a prankster who loves to play tricks whenever I can... well, there may be some truth to that!!! Click here to see all of the designs with Maxwell! 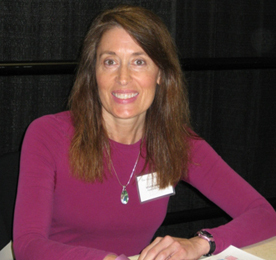 Ellen Jareckie was born in 1959 in Bennington, Vermont. As a child, she spent much of her spare time drawing. In addition to that, she kept a variety of pets throughout her childhood. These included a pet pig named Pipsqueak (who was raised on a bottle), a Bobwhite quail named Quincy, some lizards, snakes, goats, ducks, rabbits, cats, dogs, and of course mice. 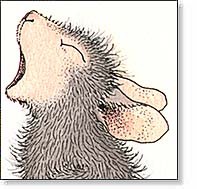 Her first encounter with mice occurred when her sister, Wren, brought home from school a mouse named Speedy. She immediately fell in love with the soft, warm and tiny creature. Not long after that Ellen also raised a litter of orphaned baby wild mice which were later released in a nearby field. Of all the animals Ellen has drawn, however, the mice continue to be by far the most popular. 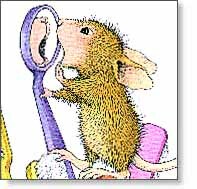 Maybe this is partly because of the human-like expressions Ellen adds to the mice or maybe because people are fascinated by their small size in comparison to our relatively large human world. 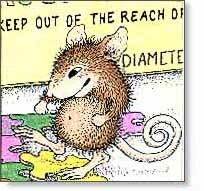 In any event, after all these years of drawing mice Ellen continues to enjoy creating these whimsical characters and it shows in the look on Mudpie Mouse's face when he gets to eat a cookie that's as big as he is! P.S. If you have discovered an injured or orphaned wild animal, Ellen asks that you contact your local Fish and Wildlife Dept. for a list of wildlife rehabilitators in your area. Some veterinarians also have lists of local rehabilitators. 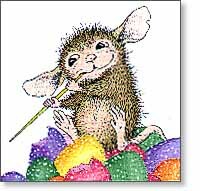 And lastly, here is A HOUSE-MOUSE DESIGNS GALLERY for YOU!!! 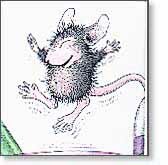 At HMD, there is a link to a place whee you can Show off your own House-Mouse and Friends Creations. It is called "Stamped By Me". Be sure to check it out! 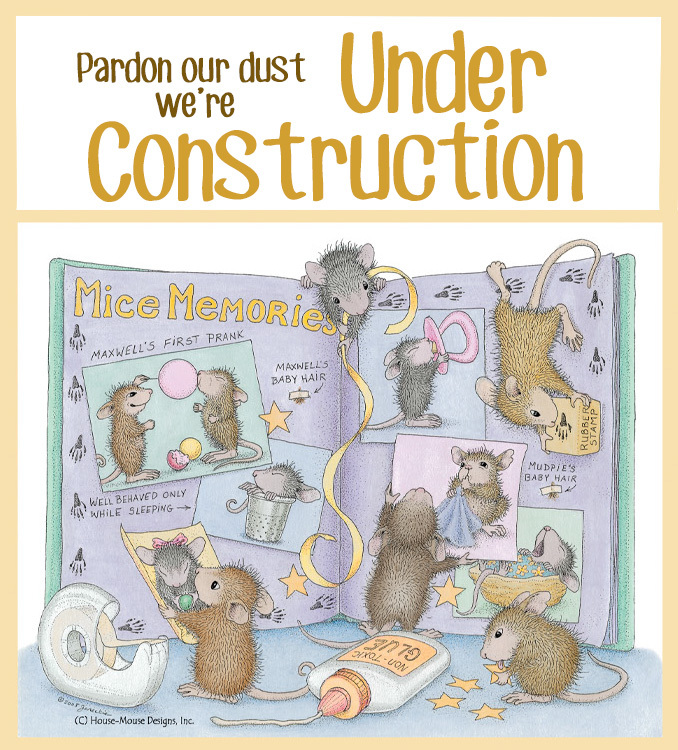 After entering our challenges on this HMFMC Blog, you may also want to head over there to submit your Creations directly to the House-Mouse Designs site, "Stamped By Me" Gallery found HERE! Eeeeeekkkk! Hope you have enjoyed your visit!